When you are shopping for a new HVAC system, whether it is an air conditioner or heater, you may come across some terminology you don’t recognize. One term that’s becoming a little more common, is “two-stage.” You will typically see this used in the description of high-efficiency air conditioners and furnaces. But what makes it different? Is it really any better than a single stage HVAC system? Keep reading to learn more about two-stage furnaces and how having one may very well be advantageous for your home. Before we can explain what exactly the term “two-stage” means in HVAC lingo, you need to know that most AC compressors move at only one speed—100%. 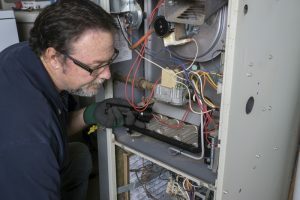 The compressor is responsible for compressing the refrigerant, and this can typically only work when the system is on “full blast.” When we’re talking about a two-stage furnace, we’re referring to the burner section inside the furnace, which is typically also only designed to function at one speed—full speed. Well… no. Sometimes, you only need your furnace to heat your home by a couple of degrees, which calls for a lower speed setting. This is where the two-stage setup, also called dual-stage, comes in. A two-stage furnace can literally run at 2 different speeds—the highest setting used for the chilliest of winter days and the lower setting used for mild days where you just want it to be a tad bit warmer inside. Two-stage furnaces operate by using a different set of programming than the normal one-stage furnace. When it’s only mildly cold inside, the furnace’s control board opens the fuel control valve to the practically open position and heats your home to the desired temperature before running off. But if your house is cooling a lot quicker due to a freezing day, then the control panel opens the valve to the fully open position, where the furnace runs full blast to heat your home. This benefits you because it saves you energy, as you may have guessed. Two-stage furnaces simply do not burn as much fuel than their single-stage counterparts, and therefore work very effectively and efficiently. They also accumulate less wear and tear as a result. Of course, this doesn’t mean you shouldn’t care for it. Maintenance at least once a year will ensure it stays in great shape! If repair needs crop up during your maintenance session, however, we do urge you to get them taken care of right away. This will help ensure your two-stage furnace works as effectively as possible for as long as possible. We’re happy to discuss your options with you and help you decide if a two-stage heating system is right for your living space. Max Sr & Paul Schoenwalder Plumbing, Heating and Air Conditioning, A Corp. has been in business for over a century. You can trust us for your professional heating services throughout the Union, NJ area, and more. Contact us today!